I started to add cosmetic micro-needling to our services menu, when it occurred to me - most people don’t know what cosmetic needling is. Most of you probably know what micro-needling is, but do you know the benefits of cosmetic vs medical micro-needling? All of the jargon gets confusing and what you really need to know is how each benefits YOU. I hope this post helps! There are OH SO MANY micro-needling devices available. Dermarollers use wheels of needles while micro-needling pens have cartridges with a cluster of needles at the tip. Both work by causing an injury to the skin to stimulate the growth of new collagen and elastin, our skin’s scaffolding. Increased collagen and elastin improves the appearance of scars and wrinkles. 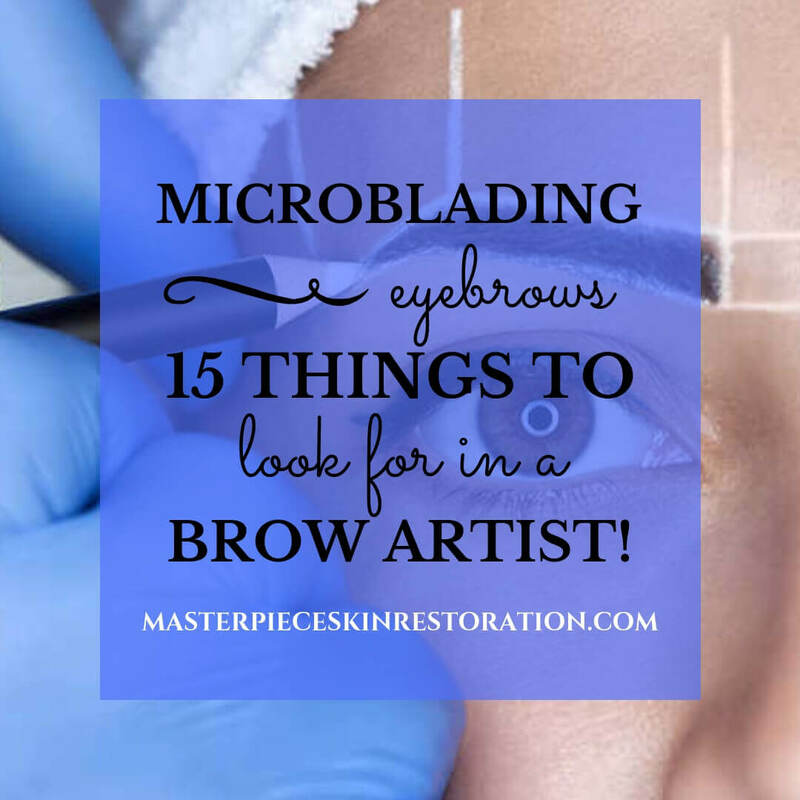 To learn more, read our blog post, What is micro-needling? What are some advantages of micro-needling? Microneedling is cost-effective, and can be done in areas where chemical peels or laser resurfacing cannot – like around the eyes or mouth. It’s well tolerated by patients and has minimal downtime. Better yet, it is easily individualized. So areas with skin damage that require a more aggressive approach can be treated with a longer needle. Micro-needling - sometimes you'll hear it called collagen induction therapy - is a simple, fast and safe treatment for wrinkles and scars. Because the top layer of skin, the epidermis, stays intact, the procedure can be repeated safely. It’s widely used to improve fine lines, wrinkles, skin texture, and acne scars. When a micro-needling device is used with topical serums, the skin’s absorption of vitamins, enzymes, lipids, and other ingredients is enhanced. The repair process begins almost immediately. Micro-needling also helps smooth small, thin wrinkles, like those around the eyes, and “does a very nice job” on upper-lip wrinkles, says Tina A. Alster, an Associate Professor of Dermatology at Georgetown University in Washington, D.C. The FDA Defines 2 Types of Micro-needling: Medical & Cosmetic. Medical micro-needling is done in a doctor’s office and goes deeper than cosmetic needling. It is done at a depth of greater than 0.3 mm and can only be done by a medical esthetician, nurse or doctor. Treatment at a doctor’s office with a medical-grade device costs anywhere from $250 - $1,000 depending on where you live and the qualifications of the person doing the treatment. During the procedure, there may be pinpoint bleeding. Afterward, your skin looks red and slightly puffy. Unlike laser resurfacing, an older procedure where healing can take a week or more, medical micro-needling offers a quick recovery. Down time is usually about one day. Learn more in our blog post, Why is a micro-needling pen better than other methods of skin restoration? Medical grade micro-needling pens, like our SkinPen by Bellus Medical, create hundreds of vertical microscopic channels in the skin. These pens are motorized and allow precise control of the needle depth – from 0.25 to 2.5 mm. A thin layer of hyaluronic acid is applied to your skin, and the practitioner selects the depth needed. The pen is gently moved across your skin until the treatment area has been covered. Topical lidocaine cream makes the procedure virtually painless. The pens have an ergonomic design that can be used to treat your entire face and those small, hard-to-reach areas. The sides of the nose, above and below the eyes, and the upper and lower lip can all be difficult to treat with other devices. Medical needling is being used for acne scars, fine lines, skin tightening, and to shrink pores. The face, neck, and chest are the most treated areas, although the pens can be used all over the body. Multiple treatments are necessary. The number of sessions depends on the skin condition being treated. deeper scars and stretch marks require 6 treatments. Several published studies have shown that medical micro-needling is effective for acne scars. The technique works great for sunken areas on the skin caused by acne, but not for deep, narrow “ice pick” scars, says New York Dermatologist, Doris Day. Dr. Day says she generally sees a 60% to 70% improvement in broad acne scars with four to six treatments. Medical micro-needling is considered a safe skin treatment when performed by a medical aesthetician, nurse, or physician. It should not be confused with the cosmetic / home needling devices that are available. Cosmetic / home needling dermarollers with short, fine needles 0.2 mm long - in combination with proper training - can be used daily to reduce pore size, oil production, fine lines, and to enhance delivery and effectiveness of skincare products. When misuse of a product causes a reaction below the skin’s surface, it is much harder to treat. In the January, 2014, issue of JAMA Dermatology, scientists from the University of Utah discuss three allergic reactions following spa treatments. These treatments included micro-needling, a Vitamin C serum, and other skin-care products. The women got itchy, disfiguring rashes that lasted as long as a year, says co-author Douglas Powell, Associate Clinical Professor of Dermatology. Avoid skin care products that have not been tested and found safe for use with micro-needling. Some of the home micro-needling devices have not undergone needed Food and Drug Administration review. Some simple medical devices can be exempt from FDA review if they are equivalent to a device that is already exempt. You can get great results with cosmetic/home dermarolling! At-home models are widely available online for $20 to $125. Dermatologists recommend consulting a medical professional before micro-needling at home and only using needles 0.2 mm long. It is important to thoroughly wash the face first with soap and water, followed by use of a quality needling device. Dull needles, or somewhat skewed needles, can result in skin damage. Aniston: I don’t go out too crazy. You mean like did I ever put leeches on my face? …The closest I’ll ever go is a derma-roller. Google it – it’s great. It’s like a little wheel that has little pins, like acupuncture needles in a way, and you roll it and it stimulates your collagen and it also allows for your products to seep into your skin. According to plasticsurgerypractice.com, micro-needling is poised to explode. We should expect to see more studies that confirm the results that medical professionals are seeing in their practices.